Distribution of gene groups in definitely and likely pathogenic variants reveal that COL4A is leading single gene cause. The overall genetic diagnostic rate was 11% (20 out of 179) in the case series when only considering definitely pathogenic variants. There were (A) 20 definitely pathogenic, (B) 18 likely pathogenic, and (C) 15 possibly pathogenic variants identified. Of the (A) definitely pathogenic and (B) likely pathogenic variants, the highest percentage was in COL4A3/A4/A5, followed by podocyte then CAKUT genes. A minority of likely pathogenic and (C) possibly pathogenic variants were also found in the NPHP genes. Numbers in graph represent percentage. Kaplan-Meier plots demonstrating that patients with pathogenic variants in genes expressed in the podocyte or associated with development defects had a trend toward an earlier age at disease onset and ESKD compared to other subgroups, although none of the pairwise comparisons were significant. The lowest P values achieved were for age at ESKD for podocyte/developmental defects compared with no proven genetic basis subgroup (P=0.06), and COL4A compared with no proven genetic basis subgroup (P=0.06). COL4A, COL4A subgroup; NG, no proven genetic basis subgroup; Podocyte, podocyte and kidney development defect subgroup. Kidney pathology in COL4A-associated FSGS often demonstrate glomerular basement membrane abnormalities. 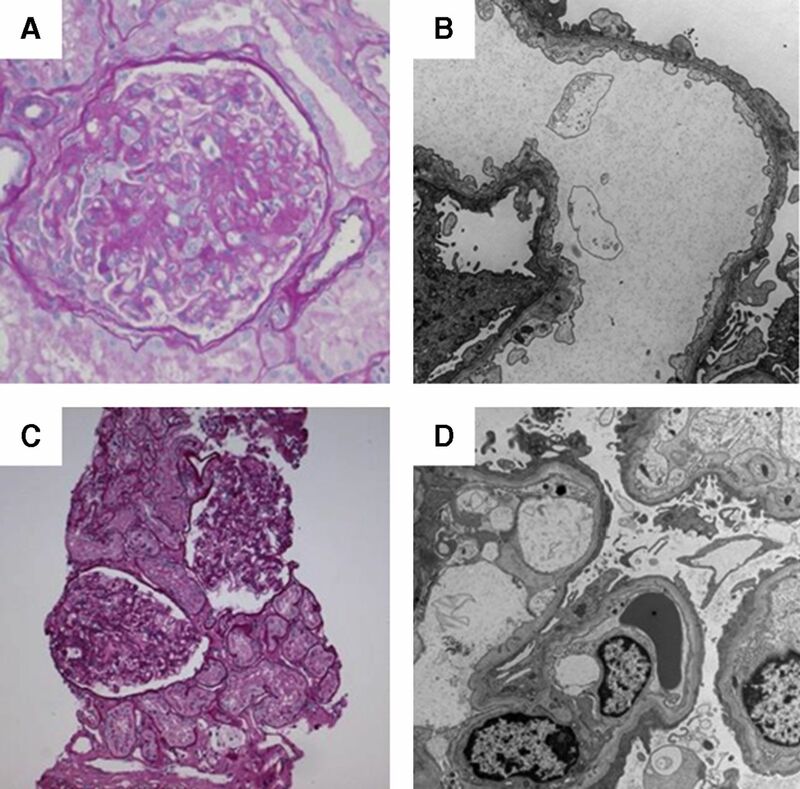 Female patient (6062) with COL4A3-associated disease showing (A) segmental scarring (periodic acid–Schiff staining, ×20 magnification), and on (B) ultrastructural examination, diffusely thin glomerular basement membranes, and extensive podocyte foot process effacement, at approximately 80% (×10,000 magnification). Female patient (6251) with NPHS2-associated disease showing (C) enlarged glomeruli (periodic acid–Schiff staining, ×10 magnification) and one glomerulus with a segmental scar (not shown). (D) Ultrastructural examination shows normal thickness glomerular basement membranes and diffuse podocyte foot process effacement, at approximately 90% (×6000 magnification). Genetic testing and pathology can be complementary tests to improve interpretation. Kidney pathology in a female (7939) with a likely pathogenic variant in COL4A3. (A) The glomeruli show mildly thickened capillary walls and no segmental scarring (in 53 glomeruli available for light microscopy; periodic acid-Schiff staining, x40 magnification). (B) Ultrastructural examination confirms thickened glomerular basement membranes, at approximately two-fold, and demonstrates extensive podocyte foot process effacement, at approximately 80% (×4000 magnification). A total of 193 individuals from 179 families had exome sequencing performed but data were not available for all participants. Number of individuals in which data are available or satisfying the criteria is indicated in the last column. ACEi, angiotensin converting enzyme inhibitors; ARB, angiotensin receptor blockers. The following minor allele frequency (MAF) cut-offs as determined in gnomAD (http://gnomad.broadinstitute.org/) were used for dominant and recessive disease genes respectively: 0.00005 and 0.005 (accessed February 22, 2018). The MAF of the only COL4A4 variant exceeds the cut-off, but it is a well established founder mutation. Patients 5515 and 5519 are brothers. (F) designates family pedigree number whereas (s) indicates a sporadic case. Het indicates heterozygous and hemi indicates hemizygous. All references refer to the supplemental reference list, which can be found in the Supplemental Material, and indicate previous reports of the variant. Age at ESKD was indicated as n/a for patients without ESKD, followed by their age at time of analysis in parentheses.. F, female; EUR, European; M, male. The following minor allele frequency (MAF) cut-offs as determined in gnomAD (http://gnomad.broadinstitute.org/) were used for dominant and recessive disease genes respectively: 0.00005 and 0.005 (accessed February 22, 2018). The INF2 variant in 2378 was shown to be de novo by examining parental sequence data. The MAF of the BMP4 variant exceeds the cut-off, but it has been shown to be functionally hypomorphic. Patients 2517 and 2518 are son and father. Patients 5496 and 5497 are siblings. The relationship of patients 5935 and 5936 is unknown. (F) designates family pedigree number whereas (s) indicates a sporadic case. Het indicates heterozygous and homo indicates homozygous. All references refer to the supplemental reference list, which can be found in the Supplemental Material, and indicate previous reports of the variant and indicate previous reports of the variant. Age at kidney disease was indicated as n/a for patients without kidney disease, followed by their age at time of analysis in parentheses. Unk indicates that data were unavailable. M, male; EAS, East Asian; F, female; EUR, European. Patients in the COL4A, podocyte/kidney development (called other), and no proven genetic basis subgroups had disease onset at 36 years (95% CI, 29 to 42), 26 years (95% CI, 17 to 37), and 34 years (95% CI, 32 to 37). The estimated mean survival/age at ESKD was 58 years (95% CI, 49 to 69), 43 years (95% CI, 31 to 55), and 62 years (95% CI, 58 to 66). The only statistically significant P values were in comparing COL4A with the no proven genetic basis subgroup for hematuria (P=0.02), glomerular basement membrane abnormalities (P=0.03), and >50% effacement (P=0.03). Number of patients where the pathology report was available is indicated. Percentages represent of available data. Absolute numbers are presented in Supplemental Table 9. 95% CI, 95% confidence interval.